The origin of transverse MO effect is longitudinal Zeeman effect. Only light of very specific polarization may experience the transverse MO effect. The transverse MO effect occurs only in the case when light has a polarization, which rotates around an axis parallel to the magnetic field and perpendicular to the light propagation direction. Light may have such polarization when it propagates in the vicinity of a boundary between two materials and the optical field at least in one material is evanescent. Fig.1 The case when light interacts with electrons of one spin. It is only the case when the light polarization rotates around axis parallel to the spin. As example, light with the polarization rotating in clockwise direction interacts only with spin-left electrons and light with the polarization rotating in anticlockwise direction interacts only with spin-right electrons.. Since the electrons of one spin direction interact with light either of left or right circular polarization, light of the left and right circular polarizations experiences different refraction and absorption, when light propagate through MO material. For the same reason, light of the left and right circular polarizations experiences different reflection, when light is reflected from MO material. These differences of optical constants for the left and right circular polarized light define MO effect in a material. Fig.2 Origin of longitudinal MO effect. Left- and right circular polarized light induces transitions to different spin-subbands. Therefore, left- and right circular polarized light experiences different refractive index and absorption. The arrows shows direction of electron magnetic moment. Figure 2 explains the longitudinal MO effect in the case of an interband transition. For simplicity, Zeeman spliting of lower band is assumed to be small and is neglected. The upper band is split into two subbands, in which electron spin is directed either along or opposite to the magnetic field. When light propagates in bulk material, its polarization plane is perpendicular to its propagation direction. Therefore, the polarization of light may rotate only around axis parallel to the light propagation direction. When the magnetic field is applied parallel to light propagation direction, the spins in each subband are directed either along or opposite to the axis of polarization rotation. Since the electrons of one spin direction interact with light either of left or right circular polarization, light of the left and right circular polarizations induces the electron transition to different subbands with different transition energy. Therefore, left and right circulary polarized light experiences different refraction and absorption. When light is transmitted through a MO material, there is a difference of refractive indexes (Faraday effect) and optical absorption (magnetic circular dichroism (MCD effect)) for left and right circularly polarized light. When light is reflected from a MO material, the reflectivity of the right and left circular polarized light is different (polar and longitudinal Kerr effects). Fig.3 Transverse magnetization & conventional ellipticity of light. No MO effect in this case. The arrows shows direction of electron magnetic moment. It should be no MO effect in the case when the magnetic field applied perpendicularly to the light propagation direction. Since an electromagnetic wave is transverse, its polarization should be in a plane, which is perpendicular to the light propagation direction. The polarization rotation is possible only around an axis, which is out of this plane. It implies that in the case of transverse magnetization, the polarization rotation around axis parallel to the magnetic field is impossible and the interaction of photons with electrons of opposite spins does not depend on the polarization of light. Therefore, in this geometry the probability to excite electrons with opposite spins is equal for left and right circularly polarized light and light should not be sensitive to the energy difference of electrons with opposite spins. It should be no MO effect in this case (Fig.3). Therefore, in common case of light propagation in a bulk material, there is no transverse MO effect. However, there is one special case, when transverse MO effect may occur. Light may experience the transverse MO effect when it has very unusual polarization. The polarization of light should be rotating around the axis, which is perpendicular to the light propagation direction. Such polarization of light is very unusual, because such polarization has a component along light propagation direction, but the electromagnetic wave is a transverse wave and by definition should not have polarization component along propagation direction. However, in the case of light propagation in a layered structure, this unusual polarization is possible. (see here for details). In the layered structure the polarization of light may be transverse elliptical. As it is shown in Fig.4, when the polarization of light is rotating around axis perpendicular to the light propagation direction and along this axis the magnetic field is applied, light interacts only with one subband of one spin direction. If, for example, the direction of the magnetic field is reversed, the direction of spins in each subband is reversed as well. As consequence, the light will interacts with electrons of other subband with the different transition energy. Therefore, the absorption of light changes and light experiences the transverse MO effect. The condition that polarization of light rotates around the axis, which is along the magnetic field and perpendicular to the light propagation direction is essential for light to experience transverse MO effect. Fig.4 Transverse magnetization & transverse ellipticity of light. There is MO effect. The arrows shows direction of electron magnetic moment. The primary reason for both the longitudinal and transverse MO effects is a splitting of energy bands for electrons with opposite spins in a magnetic field (longitudinal Zeeman effect). However, the conditions, at which light is sensitive to that splitting, are different for the longitudinal and transverse MO effects. In the case of magnetic field parallel to the light propagation direction, light of any polarization is sensitive to Zeeman's splitting and light of any polarization experiences MO effect. In contrast in the case of the magnetic field perpendicular to the light propagation direction, light of very specific polarization may experience MO effect. The conditions, when light may have such polarization, are very unique and these conditions mainly determine the properties of the transverse MO effect. That explains the reason why the properties of transverse and longitudinal MO effects are significantly different. Figure 5 shows the calculated MO Figure of Merit (FoM) for the longitudinal MO effect in Fe, FoM of transverse MO effect for a plasmon propagating at Fe/air interface and FoM of the transverse MO effect for a waveguide mode propagating in Fe/Al0.5Ga0.5As (300 nm)/Al0.3Ga0.7As (1200 nm)/ Al0.5Ga0.5As waveguides. FoM is a ratio of the magnetization dependent optical loss to the average loss. The MO effect in the case of the transverse magnetization is 2-3 times stronger than in the case of the longitudinal magnetization. In general the transverse MO effect is stronger than longitudinal MO effect. 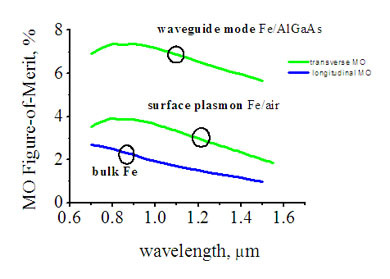 Fig.5 MO Figure-of-Merit (FoM) of the longitudinal MO effect in Fe and FoM of transverse MO effect for waveguide mode propagating in Fe/AlGaAs waveguide and for surface plasmons propagating at Fe/air interface.